What to work for yourself, but fear it holding you back? When I ask people like you, “What’s holding you backfromm working for yourself?” The most common response I get is “fear”. Fear of not making enough money to pay your bills. Fear of being an imposter. Fear of losing the acceptance of your loved ones. First, I want to let you know that having any of these fears or others is perfectly normal. It’s your brain’s way of protecting you from what it deems as “unfamiliar”. 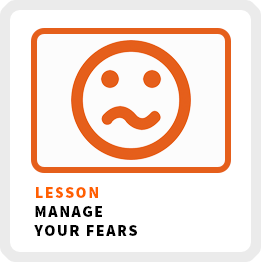 I want to teach you how to manage your fears. You see your brain runs on the sugar “glucose”. It has a limited supply, so it wants to make sure it gets used wisely. Back in our hunter-gather days, conserving your energy for “sure things” was crucial to your survival. In modern life, we can take more chances, but our brain still craves certainty. It tells you to be afraid when it hasn’t encountered a new opportunity like working for yourself before. Think of your brain as an overprotective parents constant telling you “no”. It thinks it’s doing what’s best for you, but without all the the facts. Sometimes saying “no” is the easiest way to deal with something you don’t understand. The first step to overcome your fears is to recognize it’s a natural biological function of your brain. Knowing this function occurs in your brain puts your fears in a new context. Your rational mind can evaluate your fears to see if your instinctual mind’s reaction is a valid one. Here’s the deal with fear. It never goes away. Again, it’s a natural function of your brain. What I want to help you do is manage your fear more effectively. It’s an ongoing practice you can strengthen to weaken your fears. Make a list of all your fears or maybe just the ones you have about working for yourself. That action alone is going to start weakening your fears by releasing them from your mind onto a piece of paper or a screen. Now write down the trigger for each of those fears. What’s the action you might take to cause that fear to occur? For example, you might have a fear of failure. So the trigger might be trying something you haven’t done before, but you really want to try it, like working for yourself. When you think about it, each fear is just one potential outcome for each of your actions. In reality, there are infinite outcomes and your fear is just one of them. So next to each action, I want you to think of 3 other outcomes beyond your fear. You’ll learn something about yourself as a result of what you wrote. You’ll learn something new about the subject matter you are curious about. You’ll make a new connection when someone reaches out to you because of something you wrote. Remember, your fear is just one possible outcome of many. Challenge yourself to imagine other possible positive outcomes to weaken your fear. Pick one of your fears and I want you to think of the worst case scenario if that fear came true. Say your fear is not making enough money to sustain yourself when you are working for yourself fulltime. Let’s make it even worse. Imagine you quit your job and you don’t make any money working for yourself for 6 months! What are you going to do? What are your options? What’s the plan if that worst case scenario happens? Remember, your brain likes certainty. It likes when you have a plan. When you have a plan for how you are going to handle your worst case scenario, (which is highly unlikely in the first place) your brain feels more relieved. Having a plan for your worst case scenario weakens your fear. We all have a fear of commitment in some shape or form. I think fear grips us because we view our actions as “all or nothing”. Again, your brain gets nervous about going all in on something it hasn’t experienced before. Weaken your fear by getting more familiar with whatever it is you want to do, but don’t over commit. Create a little experiment with a deadline. For example, instead of quitting your job to work on your own fulltime, try creating a side business. Work on it for just 30 days to she how you like it. At the end of the 30 days evaluate how you feel about what you’ve accomplished. Then you can decide if you want to abandon your experiment, continue it or try something else. Creating little experiments helps you gain familiarity and confidence to keep moving forward without the need to make it an all-or-nothing decision. If you try one of these experiments. Let me know how it goes!